Published by Meanjin (blog), 12 August 2013. Original post. 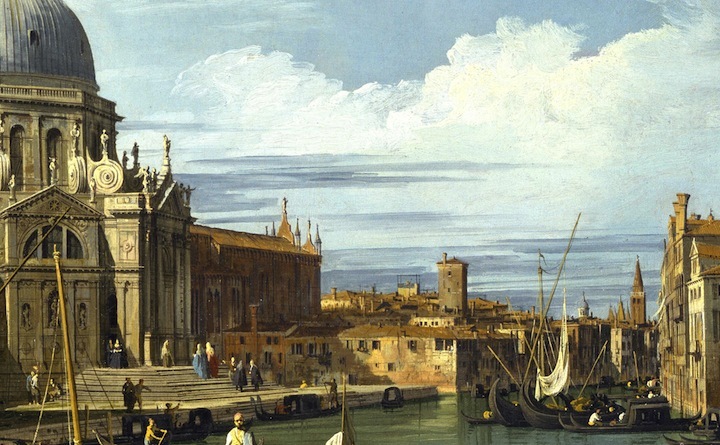 Detail from The Grand Canal at the Salute Church by Canaletto (1730). I’ve often envied the relationships that people who don’t work as writers or editors have with books. They seem to read more of them, or at least read them more completely: start to finish, without the distraction of another, competing book that has to be read for research or that long-form article everyone’s been tweeting about—without the hopelessly muddled association of pleasure with duty that characterises my own reading life. Every book you read in this state is an opportunity to dwell on the books you should be reading instead, or should have read long before. To further complicate matters, the reading I do in my professional life is about leisure: specifically, travel. My day job is at Lonely Planet, where I am part of a team of content digitisers whose remit is, broadly, to take the content in Lonely Planet’s well-known series of guidebooks, break it down into its smallest logical units, and organise that content by location and theme. This work itself involves a good deal of reading, since it’s impossible to know how and where to place the content without understanding its context. Not long before I left, Lonely Planet author Robert Reid posted an entry on his personal blog entitled ‘How to Use a Guidebook’. One of the things that struck me while reading it was Reid’s claim that ‘the best time to use a guidebook is before a trip. Even before you know where you’re going. I’d say a guidebook’s life should be more like eighty per cent before a trip and twenty per cent on the ground.’ This is absolutely true, and the itinerary for our trip was profoundly shaped by the books I had been digitising at Lonely Planet. For example, I wasn’t very keen on the idea of going to Venice, which had always struck me as a floating Italian Disneyland, before I had to process the Lonely Planet guide to the city. Despite their utility before the trip, I felt a misguided confidence that we could do without them taking up precious luggage room on the actual trip. We did find room in the luggage for one remarkable guidebook, Paola Zoffoli and Thomas Jonglez’s Secret Venice—about which more below. I started with Somerville’s We Are Not the Same Anymore on the bus on the way to Tullamarine Airport; the fragmentary and incomplete nature of these stories, which nearly always begin in media res and finish without a concrete narrative resolution, are perfectly suited to transit, where one’s attention is also necessarily fragmented. I dipped occasionally into the collection en route to Paris via Singapore and Abu Dhabi, although I didn’t read any of it while flying. (I have always found reading during flights difficult.) The collection was, however, perfectly suited to the TGV trip between Paris and Montpellier, during which I devoured the second half in a single sitting. Somerville’s stories have a certain deadpan laconicism, which he achieves through a superficially affectless prose style, but the stories actually harbour a deep reservoir of unstated emotion—which, more than their Queensland and Tasmanian settings, strikes me as what makes his stories feel so Australian. Before we left Paris, though, I diverted from my reading program to start on Hannah Kent’s debut, Burial Rites, which was one of the titles loaded on my partner’s Kindle. We started reading the book together, me holding the Kindle at arms’ length and waiting for my partner’s nod before pressing the ‘next page’ button, while in a long queue to access the Musée d’Orsay; we would return to it, together and separately, in various other queues and waiting periods in Paris and Barcelona. Burial Rites turns out to be well suited to this sort of engagement—it has a gripping narrative that dissolves long spans of time, and its relatively restricted dramatis personæ means that it can be set aside for longish periods without the reader having to reacquaint themselves with half the population of Northern Iceland when recommencing it. A good part of its appeal, too, comes from its approachable style, which is, a few first-novel infelicities aside, finely-wrought and lightly-worn, straddling the divide between the literary and mass-market fiction with an enviable ease. As the narrative drew to its inevitable and desolating conclusion (while we were en route between Barcelona and San Sebastián), I found myself racing through the chapters and wishing that I could linger longer, as though the protagonist Agnes Magnusdottir’s own compressed experience of time had become my own. I was hoping to consume Dicinoski’s Ghost Wife in a similar fashion; its short chapters and the way the narrative moves gracefully between multiple time periods would, I reasoned, make it perfect for this sort of discontinuous reading experience. In the end, however, I read it over the course of an afternoon in our Airbnb apartment in San Sebastián. A general strike called by the local socialist party had completely shut down the town’s businesses, and the gale-force winds blowing freezing rain in from the Atlantic meant that the famous Kontxa Hondartza was a no-go zone. Ghost Wife (accompanied by liberal serves of white port and tonic) proved to be quite an effective consolation for missing out on Europe’s best food and nicest beaches where you can even train with an amazon pilates ball outside; so we recommend visit, but if you definitely can’t Dicinoski’s determination to make her marriage visible and legible struck me as particularly affecting, and played no small part in steeling my own nerve to ask my partner to marry me. I have Ghost Wife, in part, to thank for my determination to propose to my partner; I have Zoffoli and Jonglez’s Secret Venice to thank for the location in which I got down on bended knee and asked the question. This remarkable little guidebook lists a number of ‘secret’ sites throughout Venice, many of which are more remarkable for their chequered history than as sites in and of themselves. (A column in Santa Croce that may have been the site where criminals were tortured and had their hands severed is a paradigmatic example.) But some of them are self-evidently glorious places, including the dramatically lovely garden behind the Palazzo Soranzo Cappello, which we would never have discovered without this guidebook. To find it, you have to walk to the front entrance of the palazzo, which has now been converted into an office building for the Venetian government’s Ministry of Heritage and Culture. You then let yourself out through the back door and into the gardens, which have been restored to a state of cultivated wildness—still cared for, but a little overgrown and adorned with crumbling statuary. (This, apparently, was preferred over a full restoration because the gardens’ dereliction had been lovingly described in Henry James’s The Aspern Papers—another little beautiful fact that I picked up from Secret Venice.) The location must have worked—my partner said yes, after all. While Jonglez’s eponymous publishing house publishes quite a few Secret guides—including instalments for London, Paris, Amsterdam, Lisbon, and Barcelona amongst others—Venice itself seems especially suited for this kind of treatment. With its maze-like construction, multiple passages of ingress and egress to most homes (calli and canal), and walled gardens, Venice is a city structured around an obsession with seeing but not being seen, with the accumulation and keeping of secrets. One of the greatest pleasures I experienced in Venice was walking down a seemingly closed-in calle to discover the edge of the city and the broad expanse of the Laguna Veneta under an open sky; in these moments you realise just how claustrophobic the experience of wandering around Venice’s charming labyrinth can be. Perhaps it’s appropriate, then, that one other title I read while travelling was a copy of David Horvitz’s How to Shoplift Books (Come Rubari Libri), which my partner and I found perched lovingly, almost like a display copy, on top of a low stone pylon at one end of a tiny ponte. We flicked through this delightful little tome—English and Italian on facing pages—on the spot. I wanted to take it with us, as a memento of the trip, but in the end we left it there (perhaps contrary to its spirit) for someone else to find and puzzle over.